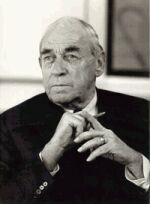 Alvar Aalto was born on 3rd February 1898 in Kuortane. His father was a surveyor and Aalto was the eldest of three children in the family. 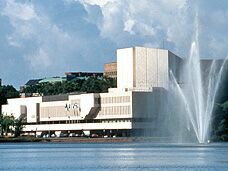 When Aalto was five years old, the whole family moved to Jyväskylä, where he was raised and educated. It was his home town for 24 years, until he went to continue his studies at the Helsinki Institute of Technology. After graduating architecture, he returned back to Jyväskylä in 1921 and opened his private architectural office there. In 1924 he married architect Aino Marsio, got two children and moved to Turku and from there to Helsinki, the capital of Finland. Ater Marsio's death Aalto married his second wife, Elissa Mäkiniemi in 1952. Aalto is above all a famous architect, whose most notable building is Finlandia Hall. As well as an architect, he is also a well-known designer of glassware, furniture and other forms of art. Aalto's work was very broad in scope and his ideas combined both an aesthetic and a practical way of designing things. This characteristic way of architecture separates him from the others. As well as Jean Sibelius, Aalto was also inspired by the forces of Finnish nature, which can be seen in his works. His vision also contributed to the newly independent Finland. During the Second World War he adopted elements of functionalism by the progressive German Bauhaus movement. Anyway Aalto didn't stay in machine-like architecture, which was typical to the movement, but only completed his own classicism expression. After the war he was influenced by his time spent in America and there he realized that good architecture is significant. Aalto died on 11th May 1976 and his career was fifty-four years long. He was a modest and popular cosmopolitan with charm, and his works were noble but progressive and definitely evoke some kind of feelings in all of us Finns. First of all he was an extremely talented and important designer, who brought Finland out into world's minds and his achievements can still be found all over the world.